Rodgers & Hammerstein's glorious musical set in 1906 pre-Union state! MHMTC is very excited to announce that our autumn 2019 production is Rodgers & Hammerstein’s Oklahoma! An instant hit when it opened in 1943 on Broadway, the story of farm girl Laurey Williams’ romances with cowboy Curly McLain and surly farm hand Jud Fry has delighted generations musical fans. 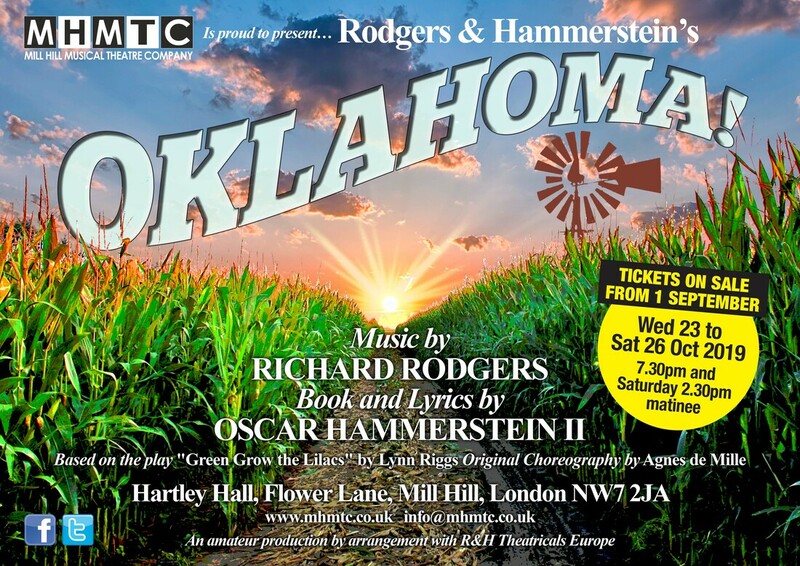 Packed with classic tunes from Oh, What A Beautiful Mornin’, The Surrey With The Fringe On Top, People Will Say We’re In Love, I Cain’t Say No and title tune Oklahoma, it also boasts great comedy characters and a sparkling script, with some quite dark moments in the sunny storyline. Oklahoma! Is being staged over FIVE performances from Wednesday 23 to Saturday 26 October 2019 at 7.30pm (plus one matinee at 2.30pm on the Saturday) at Hartley Hall, Flower Lane, Mill Hill, NW7 2JA (see map, right). The first rehearsal is on Monday 8 April, and the director is confirmed as Robin Scarborough, who directed Guys & Dolls, Oliver! and Sister Act for MHMTC. Music director is Ricardo Fernandes, who makes his MHMTC debut. Choreography is by Nikki Hurley. Auditions for principal roles will be held in May. If you're interested in joining us on stage or behind the scenes, please call email join@mhmtc.co.uk or call 07943 195490. If you'd like to support us by becoming a patron (£15 annual membership fee), please email patrons@mhmtc.co.uk.